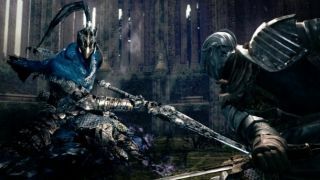 Once upon a time, beating Gwyn, Dark Souls' final boss, was itself a badge of honour. It was no small thing to have bested the unofficial Hardest Game. These days it takes a little more to impress. Some people try 'onebro' runs, taking on Dark Souls without leveling up. Others use Rock Band controllers because they like to feel themselves going hollow in real life too. Last year, speedrunner Otsunari beat the game without taking damage. These achievements have now been eclipsed by The_Happy_Hobbit's spectacular 4.5-hour run in which he never gets hit. Let's clarify: even blocking would contravene a no-hit run. Hobbit did away with armour and opted for a range of intimidating weapons that shine when swung with two hands, dodging every single incoming hit. The exceptions are the final boss fight against Gwyn, in which he bravely parried Gywn's gargantuan flaming sword, and occasional quits and reloads to reset enemies and boss encounters gone wrong (but no save files were altered at any point). Environmental damage, like falling and poison, was considered a-okay so long as it wasn't part of an enemy attack. The scripted death that forms part of the Seath the Scaleless fight was also ignored.